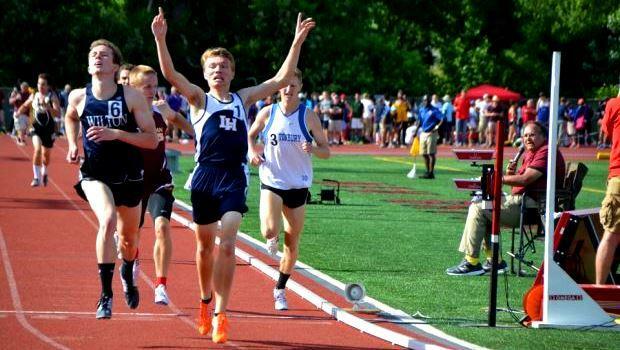 Jon Gill of Lyman Hall celebrates after winning the 800 in 1:52.90. Winning their first boys State Open title, Wetherfield was in a tight battle with Windsor, Bloomfield and Danbury the entire meet until the last half hour when Julian Campbell's results from the high jump and triple jump came in to add 15 points to clinch the win with 61 points, to Windsor's 49, Bloomfield's 48.5 and Danbury's 47.5. Coach Jeff Weber credits his senior class led by Elijah Young, who won the 400-meter dash (47.87 seconds), Campbell and javelin winner Richard Williams (187-4). "They are a bunch of seniors, who make it easy". Weber added, "they really stepped up today." While the Wethersfield boys made the winner's circle for the first time on Monday, the Bloomfield girls earned their sixth State Open title and their third under Coach Anne Burrows since 2012. Burrows, who has put together a powerhouse program that has also won the last nine Class S titles, deflected the recognition she rightfully deserves to her team. "They work endlessly." she added. "I don't know how they do what they do." Bloomfield was led by senior Erica Belvit who took second in both the 100m with a personal record of 12.03 and 200m (25.16) and ran the anchor on the winning 4x100m which blazed to a 46.96 which is the 47th best time in the country so far this year. "Erica is the key to our success this year. We last won a State Open her freshman year and we are happy to send her out on top her senior year," said Burrows. Besides the 4x100m, Bloomfield's other victory came in the triple jump where junior Adia Cavalier dominated the event with four jumps over 37 feet with her best of 37-11.5 coming on her last attempt. Normally State Open championships are won with a small group of super stars, but Bloomfield pulled off this latest championship by scoring in 10 of the 18 events to defeat Windsor 72-56. The warm day led to several nationally-ranked performances, meet records and near meet records. Glastonbury girls opened up the meet with a State Open t record in the 4x800m running 9:10.65, defeating Ridgefield and Tolland, who ironically had three members of the record-setting team from 2014 running in this race. Danbury boys barely missed the 4x800m record, set by Simsbury in 2012, running 7:52.11. The two-time New England champions in the event had to take two of their best runners out of the line up to run other events, and even then were able to let their anchor Terrell Cunningham cruise it in to save him for his other races he would run later in the day. In probably the deepest 4x100m field in State Open history, Bloomfield boys led three teams under 42 seconds to miss the record by .12 seconds. In a photo finish, Weathersfield was only .05 seconds behind and defending champion Windsor was only a quarter of a second off the winning time. To add to the fast times of the day, Bridget Chiaravalle of Danbury tied Hillhouse's Keisha Haughton's State Open record in the 100HH of 14.16 to earn a national ranking of 60th. Lucas Sumby of Old Saybrook took the 110HH in 14.74 to match his 55HH State Open victory this winter. He also added a 2nd place in the pole vault and is one of the favorites to win the CIAC decathlon to be held next Monday and Tuesday. Connecticut has recently had a great deal of success in the distance events and this year Eric van der Els has stood out as the brightest stars among a sky of stars. He recently just missed Henry Wynne's state record in mile with his 4:05 at the Danbury Dream Invitational. But at the State Open, he shattered the meet record with a 4:08.42 to run the 21st fastest time in the nation. To add to his perfect season, his Brien McMahon teammate Ajax Diamandis finished in 4:16.58. Next up for van der Els will be New Englands. "I'll be going for the state record in the 1600m," which is currently held by Kevin King of Westhill who ran a 4:07.26 in 1980. "I hope the LaSalle guys are there to push me." Over the past few years, the distance events in CT have been absolutely dominated by Danae Rivers of Wilbur Cross and Hannah Debalsi of Staples. Rivers has ruled the middle distance races while no one has challenged Debalsi in the 3200m. 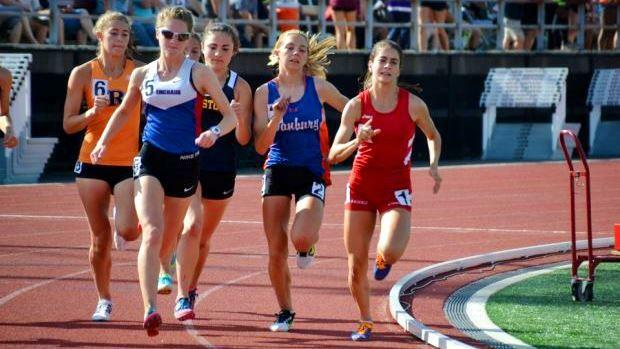 In their last State Open, Rivers was finally defeated by Jessica Drop of Coginchaug who ran 4:48.29, which is less than a second off of the Cross senior's meet record she set two years ago. In the 3200m, Drop doubled back and tried to take down the other CT distance titan. Debalasi went out to an early lead, but this time Dropp stuck within range of the Staples senior. Drop tried to use her finishing speed but only managed to narrow the gap an Debalasi managed to pull off her 8th 3200m title during indoor and outdoor track. Baker came in with the fastest time of the year in the 200m and lived up to expectations by winning in 25.00 with Belvit taking runner up honors again and Brown earning the bronze. Porcenat, who came into the Open seeded 11th and wasn't expected to score came up big for the Hatters and ran big PRs in both the 100m and 200m to contribute 10 point between both events. Junior Mark Doyley of Weaver, defended his titles in both the 100m and 200m events. The All American in the 60m dash this indoor season has once again proved that he is the fastest boy in Connecticut. He led five individuals under the 11-second barrier. In the 200m, there was an anticipated match- up between Elijah Young of Wethersfield who won the 400m in 47.87 and Doyley. The Weaver junior turned on the afterburners the last 50m and easily pulled away to win 21.46 to 21.84. Glastonbury swept the boys and girls 300IH. Danielle Briskman dropped 1.4 seconds off her previous best to win with a time of 43.70. Soon after Keylon Dixon, who had the top seed and was the fastest returner from last year took top honors running 38.88. With defending champion Danae Rivers opting out of the girls 800m this year, that left the door open for someone new to take home the title. Sophomore Emily Philippides of Greenwich led wire to wire in 2:11.90 followed by Alexandra Alsup of Coginchaug in 2:14.11 and Leah Sarkisian of Danbury who moved up from 6th to 3rd over the last 100m. In the boys 800m, all the talk this season was focused on Randy Neish of Glastonbury who ran 1:51.42 a month ago and Trumbull's Tyler Gleen who ran 1:52.21 at the Danbury Dream Invitation. With Gleen running in a slower heat after a sub-par race at the Class LL championships and posting a time of 1:53.07, it put the pressure on the fast heat. Neish took it out through the 400m in 54 second but wasn't able hold the lead and Jon Gill of Lyman Hall dropped 2 ½ seconds off his personal best to win his first State Open title. Last year, state record holder Alex Ostberg had a season ending injury and that made it easier for Eric van der Els to capture his first 3200m State Open title. This year, with van er Els running the 2nd fastest time in state history, he decided to skip the 3200m to focus on the 1600m. Gabe Altopp of Ridgefield who finished 2nd in the cross country State Open came from behind as he likes to do and won in 9:07.64 with Jack Adamski of Danbury running a 10 second personal best to take 2nd in 9:11.84 and preventing a Ridgefield sweep by holding off Ian McKool who was less than a second back. Wilbur Cross, with a team of Rivers and her sister Leah, Erica Snape and Curtis ran 3:50.47 to come with in a second of breaking Windsor's State Open Record. Windsor won the boys 4 x 400m in their season best of 3:19.84 over Danbury by two tenths of a second. Those two tenths had a huge impact on the team standings as those points moved Windsor into 2nd and left Danbury one place behind Bloomfield in 4th. In the field events Samantha Stevens of Shelton defended her title in the shot with a PR of 42'2 and moved up one place in the discus by setting another PR with a throw of 130'0. The boys throwing events saw a similar dominating performance as Geoff Kirk of Avon also swept the shot and discus by setting PRs of 52'1 and 163'11. Richard Williams of Wethersfield helped his team to the title by taking over the state lead in the event with a RP of 187-04 for the win and Samantha Moravsky of Shepaug threw the 43rd best throw in the country with a 141'10. There is always drama in the pole vault and this year is no different. Anything can happen and being a favorite doesn't mean much once the competition starts. AmyErin Zadroga of Tolland has the 3rd best jump in the state this spring, but has been at 11 ft since winning the indoor State Open. But Zadroga chose the State Open to clear 11'6 for the first time to defeat state leader Ava Coleman of Mercy on her last attempt. If the Tolland junior didn't clear the bar, it would have been a tie and gone into a jump off to declare a winner. Last year was an incredible year for the boys vault with three athletes tying the State Open record and Chris Rough of Westhill clearing 16'0 to defeat Joseph Fogarasi of Windham and Ian Bergere of Hand who clearned 15'6. Eight of the top 10 were senior and few fans expected this year to be as strong. But with five of the top eight returning next year, who knows if some of the records could go down. Three athletes cleared 14'0 but only Devon McShane of Hand had no misses and was declared the winner. With the season winding down, the Connecticut High School Coaches Association (CHSCA) has declared the following 2016 Athletes of the Year for Outdoor Track & Field and will be honored at the All State Banquet on June 22nd at the Aqua Turf Banquet Hall in Southington.